This postcard was sent in 1912 by 14 year old Richard Rudston Langrish, to his mother, Ellen Langrish, after he left the family home on Alma Terrace off Meeting Street. He posted the card when he arrived safely at HMS Ganges, the Royal Navy Training Depot at Shotley Point (opposite Harwich). 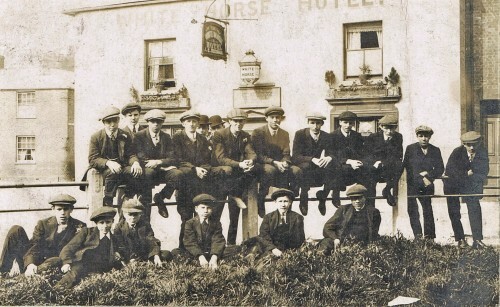 The photograph shows nineteen Quorn lads sitting on the fence and grass of the ‘Little Green’, which would later become the Memorial Gardens. It is likely that at least four or five of them were killed in WW1. Richard’s younger brother, Edward Basil Langrish (known as Basil), was killed in France just before the armistice. The White Horse coaching inn can be seen in the background. It is notable that the door used to be on Leicester Road and not on Station Road as it is today. Missing information: Can anyone provide any names?